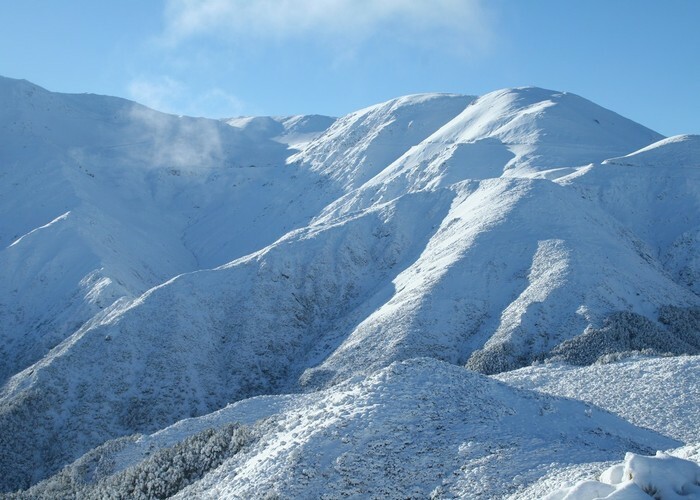 A short climb from the Awa Awa Rata Reserve to Scotts Saddle on the Mt Hutt Skifield road. Scott's Saddle • By Matthew. Licence: C.
Several short walks lead off from Awa Awa Rata Reserve picnic area at the foot of Mt Hutt, and this is the longer alternative. Mt Hutt • By Matthew. Licence: C.
The research has toilets, a picnic shelter, and a rich variety of rhododendrons, maintained by volunteers. Take the road up to the top of the reserve. Three tracks meet here. Take Scott's Saddle Track into the forest on the right. This track climbs quickly through beech forest. After 20 to 30 minutes, you come onto the ridge. The Ridge Track leads off to the left, while Scotts Saddle Track sets off to the right, dropping briefly before climbing on the ridge. The track breaks out of forest and into scrub about 45 minutes from the bottom, with good views of the stream below and the range opposite. After a short climb, an easy poled route crosses stony herbfield dotted with miniature beech trees. 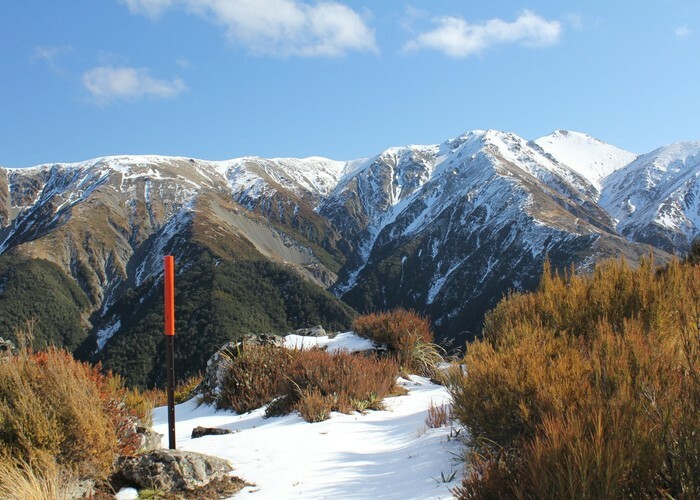 Eventually, the track eases to the west of the ridge, crossing a scree, and climbing to its high point, with grand views of the skifield and the upper Pudding Hill Stream catchment. From here, it drops along a 4WD road to the saddle. A return journey along the skifield road is not a particularly scenic, and is downright dangerous in winter due to ice and traffic. Another option would be to drop down to the Ridge Track and then take the Opuke or Alder Tracks back to the reserve. A much more challenging return option is the Pudding Hill Stream Route. Added 13 August 2007 by MatthewMatthew. 3 revisions, most recently 27 August 2014 by MatthewMatthew. 500 views in the past year (42 per month).